Gina Odom, Realtor: Urban sprawl kills trees so plant them upward! Brilliant! Urban sprawl kills trees so plant them upward! Brilliant! About a month ago I was talking to my gal pal who is a frequent flyer of all airplanes. She was telling me how much she enjoyed reading Hemisphers Magazine published by United Airlines. You know the one that shares a space in the back seat pocket next to Sky Mall. I always find some sort of entertainment from Sky Mall with all there whacky knick knacks and miracle cures but Hemispheres has always bored me and I often thumb through it faster than the flight attendants finish their safety demonstration. However, on my last trip to Houston based on my trusted friend's recommendation, I decided to give a whirl. And to my surprise, I found many articles of interest including one titled Plan G - cutting edge fixes for the world's trickiest environmental problems. 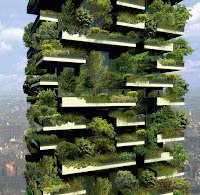 Here is my favorite of the fixes: Bosco Verticle, a two story building apartment complex that will double as the world's first vertical forest. 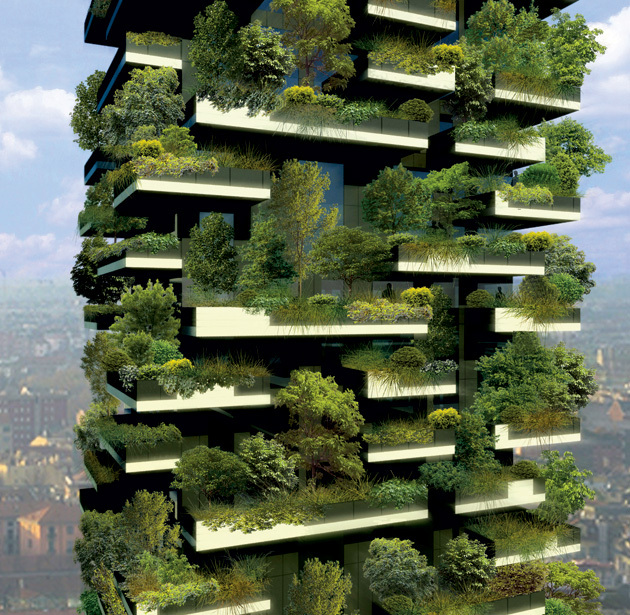 Built in Milan, every unit will have a concrete balcony planted with humidity-creating and CO2-filtering trees, shrubs and flowers that will get their nourishment from recycled gray water. The buildings themselves will rely on the sun for much of their power. And guess what, this solution comes cheap! Apparently, construction costs will only increase by 5%! Way to go Milan. Hi it's me, I am also visiting this web page on a regular basis, this site is really pleasant and the visitors are in fact sharing pleasant thoughts.